Baby Hazel at the beach! 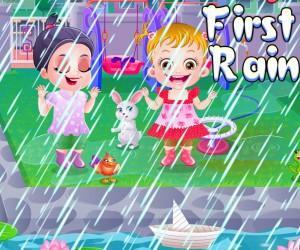 Baby Hazel At The Beach is a fun and easy to play flash game that parents will appreciate and kids will enjoy. The story is divided into two levels. Level One is all about packing up for the big day at the beach. Level two takes place at the beach, where your job is to keep the baby happy. You’ve also got to keep her from getting burnt by too much sun! The gameplay is intuitive and requires only two competencies: drag and drop and point and click. To pack the baby’s bags for the big day, players drag beach clothes, sunglasses, teddy bears and umbrellas to her bags from locations around the room. To keep her happy at the beach, point on the carrot juice, bear-shaped lolly or balloons she’s dreaming of and click to put a smile on her face. When she’s happy, she giggles and radiates little hearts. Beat a level and a yellow smiley appears to blow heart-shaped kisses. Some skill is involved. Players have to closely follow directions. Select the rubber ducky, which is not on Hazel’s packing list, and lose 50 points. Players have to be problem solvers, too. A few of the items are hidden away behind doors. Players also have to stay quite alert in order to keep up with Baby’s rapidly cycling needs. Wait too long to bring her little shovel and she’ll start to cry. It’s not a great idea to keep her waiting for the sun screen either. She’s not very tan, so there is a burn risk. There’s no leader board or multiplayer action. Baby Hazel At The Beach is just a simple, fun and educational flash game that kids will enjoy while improving skills like instruction following, problem solving and concentration. It is a bright summer day. Baby Hazel wants to chill in the beach. She is dreaming of lying under the sun, playing beach games and making sand castles. First help Baby Hazel pack her bags. Collect beach toys, games, dresses, accessories and place them in bags. Then, take Baby Hazel to the beach and play different games, make sand castles, search for seashells and enjoy many other activities with her.So, get ready and have fun!